I’m not really much of a chocolate person, which is particularly funny because I worked for a chocolate company for some time, developing recipes. What’s even more hysterical is that a large part of my role was – get this! – quality control. I would take samples from each production batch to make sure a multitude of things were correct – texture, flavor strengths, visual appeal, etc. Sounds like a dream job, no? But the ironic thing is, when you’re around THAT MUCH chocolate all the time it becomes routine not to be phased by a very generous all-you-can-eat policy or rows and rows of truffles coming out of the cooling tunnel or a 400 gallon melter filled with 72% Valrhona chocolate. It becomes part of your everyday life and I was pretty good at it. I think that was due in large part to the fact that I didn’t get all crazy and overindulge. Yes, I know how utterly ridiculous this all sounds. Now don’t get me wrong. I do love chocolate. I just tend to lean more toward the vanilla/fruit/caramel spectrum of desserts. But once in a while, I get a hankering for something chocolaty. Brownies, rich deep cake, cookies, hot fudge. Oh god, hot fudge. When this happens, no ordinary Hershey bar will do the trick (ick by the way.) I want something deep, dark, rich and delicious. This happened the other day and because I am who I am, there’s quite a bit of chocolate of various cacao percentages kicking around my apartment. 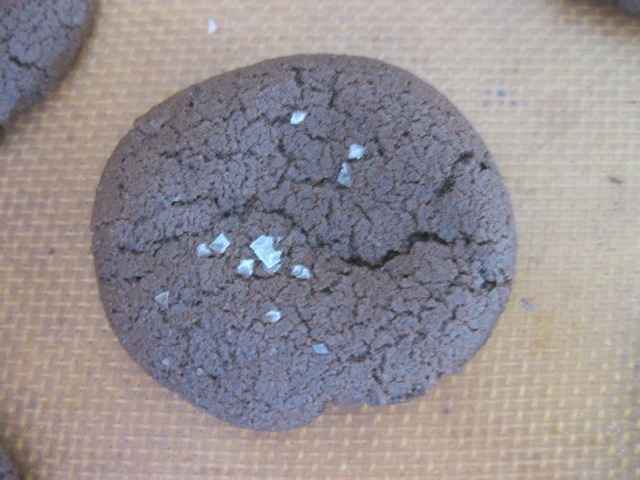 It was time to whip out the double chocolate cookies that have been in my repertoire for a while. A keeper is a keeper. I pulled out my stained, battered notebook where I keep my favorite recipes. Right there on page 135, a surprisingly clean page, was the recipe written in my typical shorthand – ingredient quantities, minimal instruction. If anyone ever gets a hold of my recipe book, they’ll really have to know what they’re doing. This is a great cookie – deep, dark and chocolaty. Fudgy on the inside, crisp on the outside. Chocolate melted within the batter plus chunks baked right in to give it that extra chocolaty oomph and some texture. And my favorite part – just a pinch of coarse sea salt on top to give it that wonderful sweet-salty contrast I love so much. What I typically do is scoop out the whole batch of batter and freeze them solid on a parchment lined sheet pan. Then I pop the little frozen balls of goodness into a labeled Ziploc (including the oven temp and baking time) and store them in the freezer. This way, I have cookies ready to go at a moments notice. Most importantly, I don’t have to bake – and EAT – the whole batch right away. I’ve learned that this is never a good idea. A couple of key things to keep in mind – use good chocolate. Sure these will turn out great with regular old Nestle chips but spring for the good stuff – 60% cacao or more – if you can. When using good chocolate, use it in recipes where it will make a difference. Like this one. Callebaut, Valrhona and Scharfen Berger are all becoming easier to find these days – check Trader Joe’s, Whole Foods and World Market. Important thing to remember #2 – do not over bake these cookies. You want them just a bit underdone so they’re nice and fudgy inside. They should be soft to the touch when you take them out of the oven, as they’ll continue to firm up on those hot baking sheets. If you’re unsure of how your oven behaves, do one tray first as a tester. And get an oven thermometer. Sometimes instead of or in addition to vanilla extract, I’ll use chocolate extract. Crazy, huh? I met the Star Kay White people a while ago and they gave me a bottle of their chocolate extract to try. I find it rather interesting – the flavor isn’t slap-you-in-the-face-super-duper-chocolate but it does seem to uplift the chocolate notes in most recipes. If I remember I have it, I’ll add it to kick up that flavor just a bit, usually in addition to the vanilla. You can find this at cookware stores (Williams Sonoma, Sur la Table) and I’ve seen it at Whole Foods as well. If you can’t find it, no worries it’s just something interesting to try. For that matter, I sometimes substitute dark rum for vanilla but that’s another story for another time. I honestly don’t know how long these suckers keep. A few days? They’ve never been around long enough to find out but that sounds about right. STRESS BAKING THERAPY FACTOR: HIGH. This recipe has two things going for it. One, it’s chocolate. That always scores way up on the stress Richter scale. For most people, nothing calms the nerves more than chocolate. Two, it’s double chocolate. More is always better when it comes to chocolate. Am I right or am I right? Preheat oven to 325°F and line 2-3 sheet pans with parchment paper or silicone baking mats. Let the chocolate cool slightly while you sift together the flour, cocoa powder, baking soda, and salt in a medium bowl. Set aside. Transfer the melted chocolate to the bowl of a standing mixer fitted with the paddle attachment and on medium, add the sugar, eggs, and vanilla and mix until combined. Reduce speed to low; gradually mix in flour/cocoa mixture. Add the chocolate chunks/chips and stir on low until just combined. Note: the dough can be frozen up to two months at this point. Easiest is to shape it into balls, freeze on a sheet plan then transfer to a Ziploc once frozen. Or shape into logs, wrap tightly in plastic then slice-n-bake. Frozen dough’s can go right from the freezer to the oven, just add a few minutes to the baking time. With a small ice cream scoop (1”) or a teaspoon, scoop Tablespoon size balls of dough and space cookies 2” apart on prepared sheet pans. Note: I refrigerated the dough overnight, which made it very firm and rather difficult to scoop. 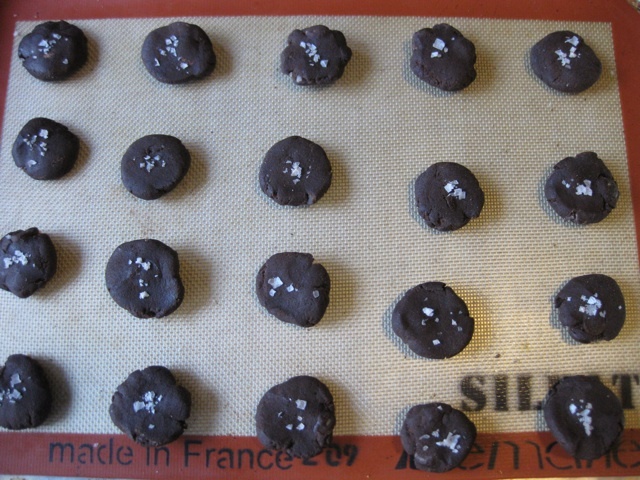 As shown in the pictures here, I flattened each dough ball so the cookies would bake more evenly. If you use room temp dough, you don’t have to do the flattening part as they will spread nicely in the oven. 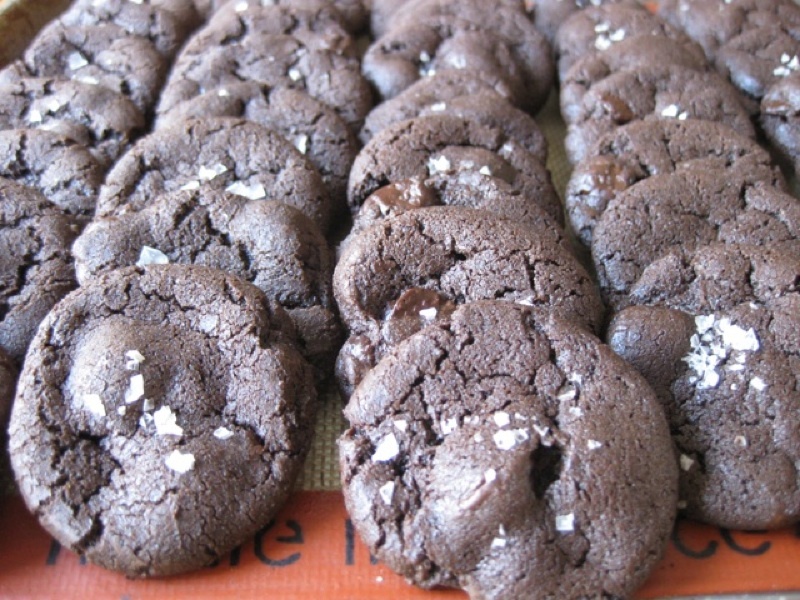 Sprinkle a small pinch of sea salt on top of each cookie. Bake 12 minutes, rotating sheets halfway through baking – top to bottom and front to back. The cookies will be quite soft coming out of the oven – once cool, they should be crisp on the outside but still soft on the inside. Adjust baking time if necessary. Let cool on pans then carefully remove and place on serving tray. Cookies will keep for a few days, tightly wrapped. Chocolate extract… hrm, never heard of it but sounds fun to cook with! I bet making chocolate sugar to top sweet breads like you would make vanilla sugar would be awesome. Your cookies look yum-o. Funny I needed a kick myself last week too! I wonder how many calories are in these bad boys? I am drooling……. Well, it all depends on how you feel. I’d say none because they’re absolutely necessary in times of stress. Work for you?